The McDougal Graduate Teaching Fellows at the Poorvu Center lead programs on effective and innovative teaching, develop teaching resources, and provide individual consultations for graduate student instructors at Yale. The Poorvu Center emphasizes teamwork as well as individual participation. 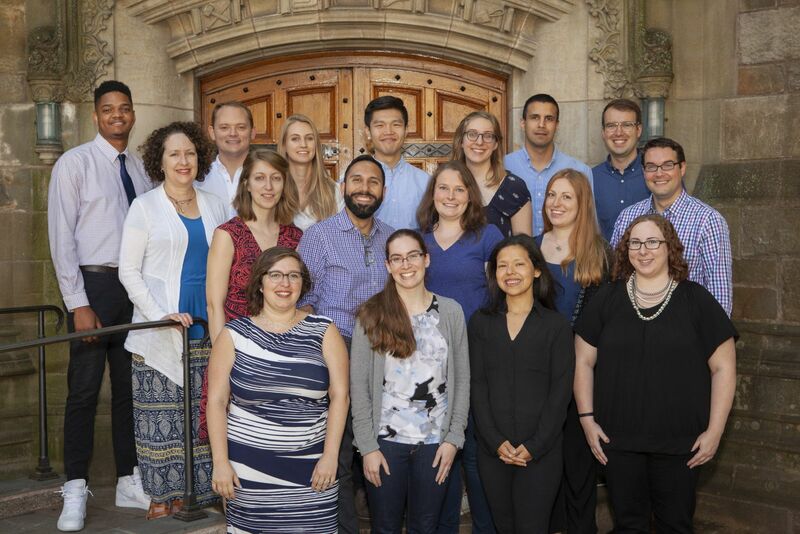 This group of approximately 20 doctoral graduate students facilitate a wide array of programming, including Teaching at Yale Day for first-time teaching fellows, discipline-specific Fundamentals of Teaching workshops, and advanced teaching workshops. Graduate Fellows work within their own departments or disciplines and across disciplines. In early May, fellows receive 12 hours of training (required) over two days to prepare them to serve as consultants and workshop leaders. An additional day of mandatory training takes place in mid-August. Fellows attend bi-weekly staff meetings throughout the academic year, during which they contribute to the direction and offerings of the CTL and continue to develop their own teaching. McDougal Teaching Fellows are supported by a generous gift from the McDougal family. Team Work: Fellows work as part of a team of approximately twenty McDougal Teaching Fellows, plus two McDougal Teaching Fellow Coordinators and the CTL leadership. Part-Time Commitment: Fellows work 6-8 hours/week in a flexible schedule that fits with most coursework, lab, teaching, clinical, and research activities and personal lives. Not every week requires constant effort: fellows are able to plan their schedules, in consultation with the two graduate fellow coordinators, so that they may have some off weeks combined with some busy weeks. Compensation: Fellows receive training, a shared office, and a $5,000 honorarium for the academic year. The honorarium may be held jointly with most research, teaching, and dissertation fellowships from Yale and outside funder agencies. Applicants must be registered graduate students in good academic standing with at least one semester of Yale teaching experience. To apply, please complete the online form and email the following materials to Suzanne Young. Please place all documentation into a single PDF file and include your last name, first name, email address, and phone number in the header of the file. A description of the teaching development activities (including Poorvu Center workshops and events) in which you have participated. We will accept additional documents in support of your teaching – a faculty letter, a peer observation report, a Poorvu Center consultation report, etc. – but these are not required. Please include any additional documents in your application packet.